Isn't this the kind of over-the-top opera plot that I discussed last week? If only this tragedy weren't true. Here's how it unfolded: the son of a famed opera star shot a young Pennsylvania camp counselor in the head (amongst other things) and then got away with it for some 18 years. That is until technology caught up and finally led to his arrest. Jeffrey Plishka, 46 -- son of internationally known Metropolitan Opera bass Paul Plishka [R], had long been the prime suspect in the chilling 1991 murder of Laura Lynne Ronning, a college student who worked at a Poconos sleepaway camp near the Plishka family's farm in Honesdale, Pa. But shortly after the murder, with his wealthy dad's help, he moved to Florida and then bounced around from state to state for the next two decades. "The family has done everything it can to keep him off the radar," one former family friend told the New York Post. Don't you just love how those "former family friends" are so quick to rat out your family business to the press? At Jeffrey Plishka's bail hearing, DA Lehutsky declined to comment on whether the Plishka family had cooperated during the investigation and also noted that the accused killer "has considerable family resources" that made him a flight risk. Paul Plishka did not return the Post's call for comment. 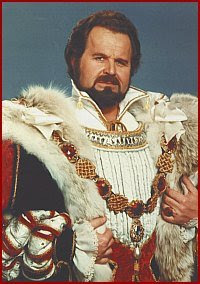 Paul Plishka, who has been with the Met since his debut as Monk in La Gioconda in 1967, also appears regularly with major opera companies in North American cities such as San Francisco, Chicago, Philadelphia, Seattle, Baltimore, Houston, Pittsburgh, Dallas, San Diego, Toronto, Montreal and Vancouver. In Europe, Paul Plishka has performed in Geneva, Munich, La Scala, Hamburg, Barcelona, Vienna, Berlin, Zurich, Paris, Lyon, Marseilles and Covent Garden, London.